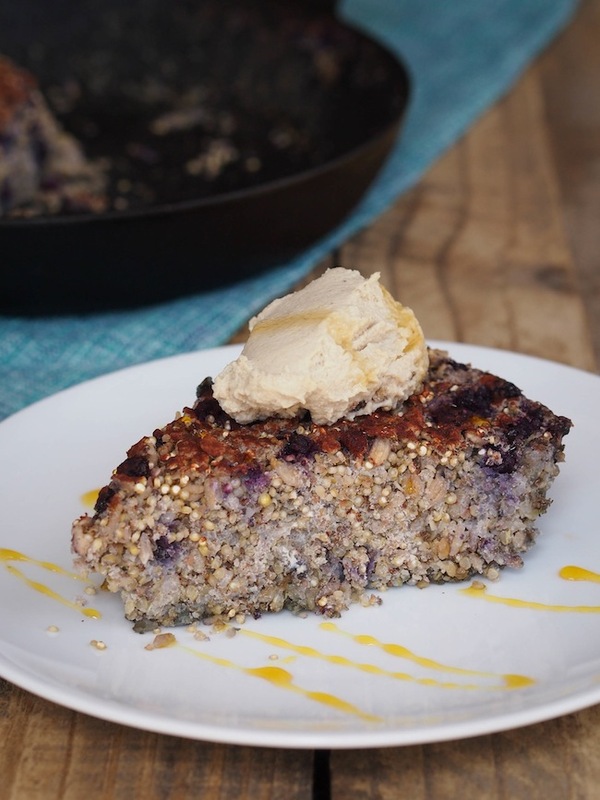 This multigrain vegan blueberry breakfast bake has no refined sugar and takes only 10 minutes hands on time to make. 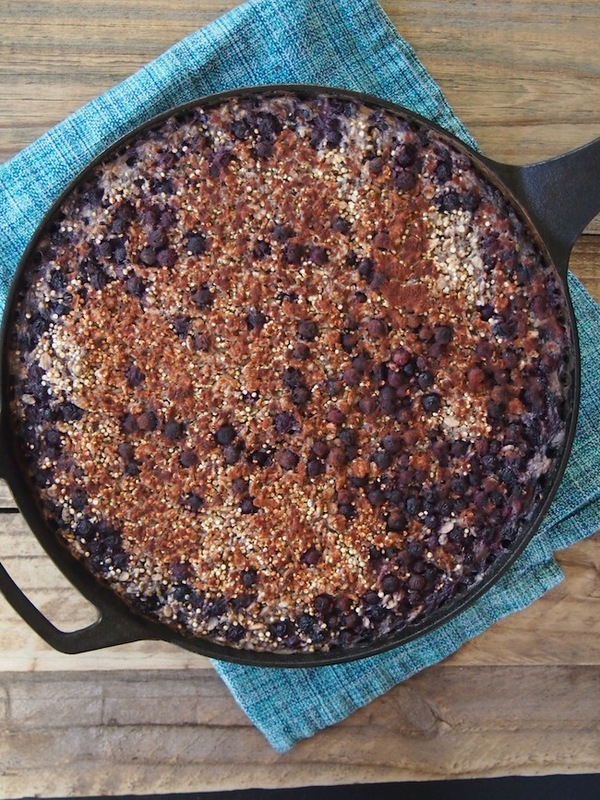 It's a great way to use up the random whole grains you have on hand! Mornings just ain't my thing. Breakfast however, is absolutely my thing, and one of my favorite things at that. I'm always on the lookout for great recipes for make in advance breakfasts that I can simply heat and eat in the morning. 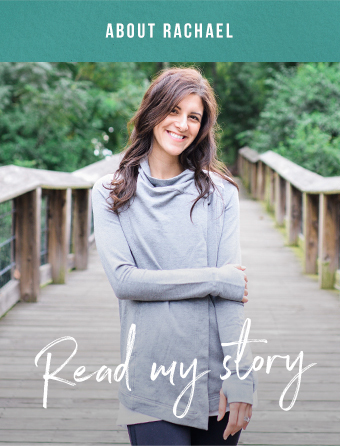 When I stumbled upon this recipe from fANNEtastic Food for a vegan quinoa bake that involves simply dumping ingredients in a casserole dish and baking, I knew I hit gold. The original recipe calls for only quinoa, but I decided to make mine multigrain by using a few different types of whole grains. It adds a interesting texture and helps use up the random bits of leftover grains you might have from buying in bulk. I think you could use basically any intact whole grain that normally cooks in about 15-20 minutes in varying proportions. I used a mixture of quinoa, barley flakes (which are like oats) and kasha because that's what I had, but you could also swap in amaranth, buckwheat groats, freekeh, kaniwa, millet, oats or teff. There's a whole world of whole grains out there and this is the perfect recipe to experiment with them in! Instead of using apples, I decided to use wild blueberries, one of my favorite brain boosting foods. Last week, I taught a class of elementary age kids at a local private school about how to "eat the rainbow." We talked about the health benefits of the different colors of produce and how blue/purple foods boost brain health and memory. One of the teachers emailed me this week and said a student stopped them in the hallway and said "I ate blue today. I bet my brain is smarter!" Y'all, that cracked me up and seriously made my day! And you know what, his brain probably is smarter! Blue/purple foods, like blueberries, are a rich source of anthocyanins, a purple pigmented phytochemical in the flavonoid family. Anthocyanins improve memory and prevent age related decline in cognitive function by decreasing inflammation and improving blood flow in the brain. Deep purple wild blueberries, which are available frozen in most grocery stores, are even richer in anthocyanins than conventionally grown, which already pack a hefty dose. I served this with leftover cashew cream from my paleo pumpkin pancakes, but feel free to use a scoop of plain Greek yogurt and a drizzle of honey. This is also great topped with a sprinkle of toasted nuts or served cold with almond or coconut milk. 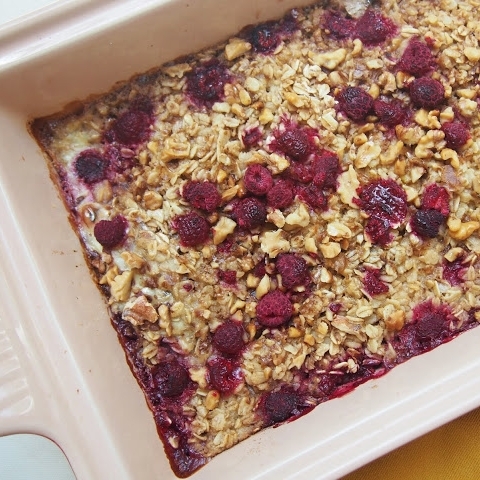 This recipe is a great way to use up leftover whole grains. Feel free to use any type that cooks in about 15-20 minutes - teff, amaranth, buckwheat groats, and millet would all work well. 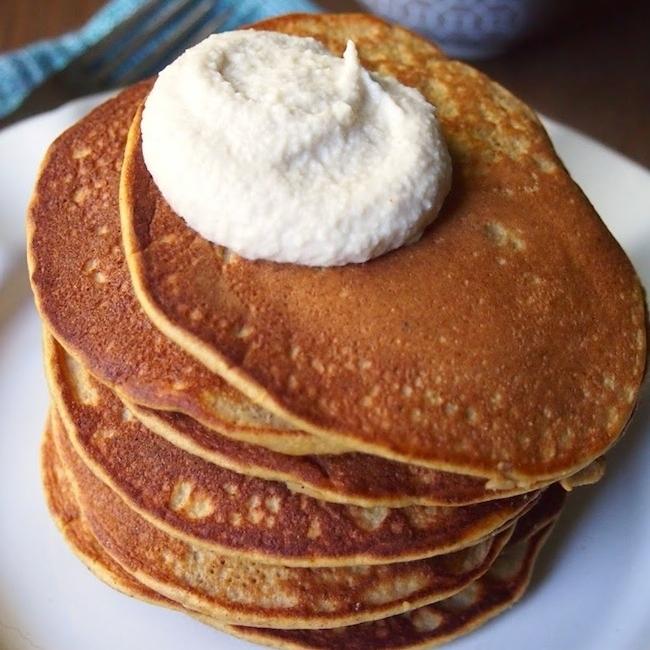 Serve warm with Greek yogurt, cashew creme and a drizzle of honey or cold with unsweetened almond or coconut milk. Adapted from fANNEtastic Food. In a large bowl, mix together quinoa, barley flakes, kasha, coconut oil, chia, hemp, vanilla extract, cinnamon and salt. Add in blueberries and toss to combine. Stir in milk. Pour into an oiled baking dish. I used a large cast iron skillet but you could use a rectangular baking dish. Dust the top with more cinnamon. Place in the oven and bake 45 minutes until liquid is absorbed and top is golden.